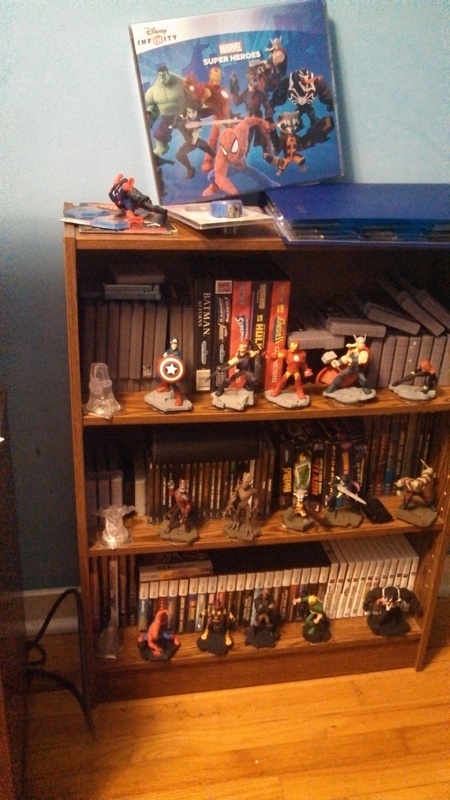 Ever since the “Toys-to-life” genre was kickstarted with the original Skylanders back in 2011, I’ve been dreading the day when anyone would apply that model to a property I care about, as if there’s two things I love to collect, it’s video games and action figures. 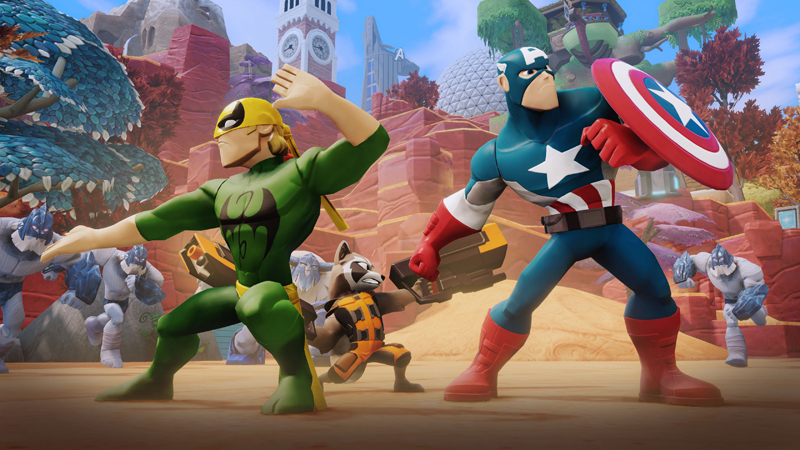 Last year Disney jumped into the game with the first iteration of Disney Infinity, and we all knew that sooner or later the model would be applied to the characters of the Marvel universe. 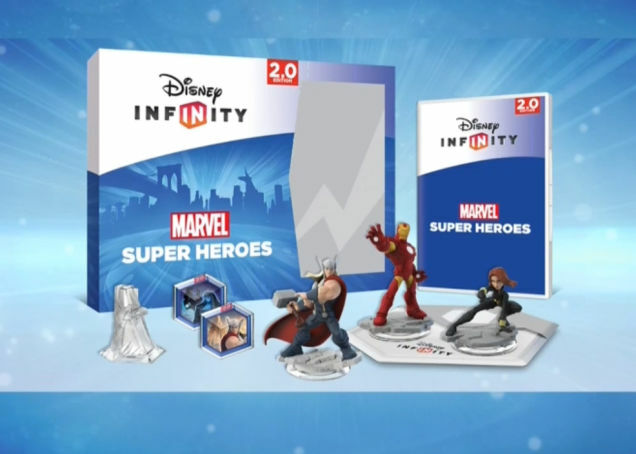 That day has finally come with the release of Disney Infinity 2.0: Marvel Super Heroes, and depending on what you want out of this massive money sink of a project, you may want to hold on to your money. There are countless ways to evaluate Disney Infinity 2.0: A parent playing with a child, a couple in a relationship bonding over a rather simplistic game, or someone who just wants to forget about everything and jump in to the Toy Box; A tool that lets you create your own games and world populated with whatever your imagination can think of. These are just some examples and why exactly it’s so hard to review a game like this. I’m a 30-year-old who loves to play comic book games, collect toys, and have never really seen the appeal in games like LittleBigPlanet where the main goal isn’t playing a game, but building one. If you fall firmly in my camp, this game is not for you. 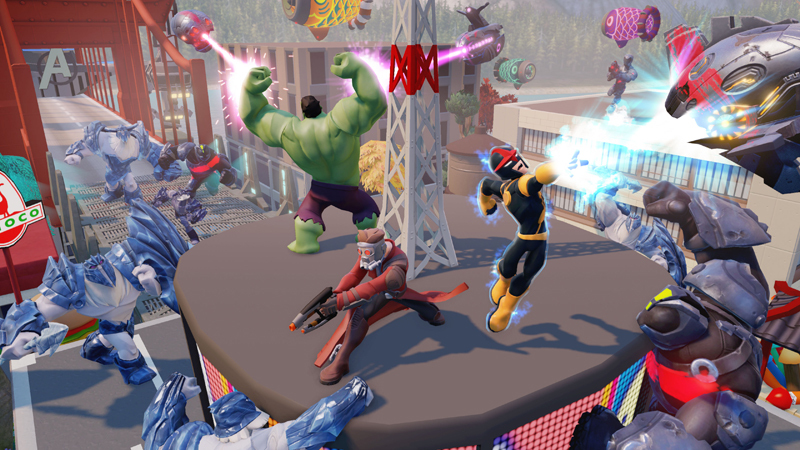 Last year’s Disney Infinity, much like this year’s, came with three figures however each figure came with their own “play set” (Disney Infinity’s version of a traditional campaign) effectively giving you three several hour campaigns for the price of one. 2.0 only comes with one play set that is incredibly monotonous. The story involves Loki invading New York with the help of the Frost Giants and it’s up to Earth’s Mightiest Heroes to put a stop to his plan…by punching a LOT of Frost Giants. You have several different quest givers each providing a handful of different mission types that all boil down to hit the same three types of enemies over, and over. Sometimes you’ll be tasked with escorting a vehicle or person, trying to defend an object, or tailing an enemy without being seen, yet whether or not something sees you or not is irrelevant as the mission is STILL all about hitting things. All of the missions take place in an open world version of New York City that is cold because of the story but also in heart as well. 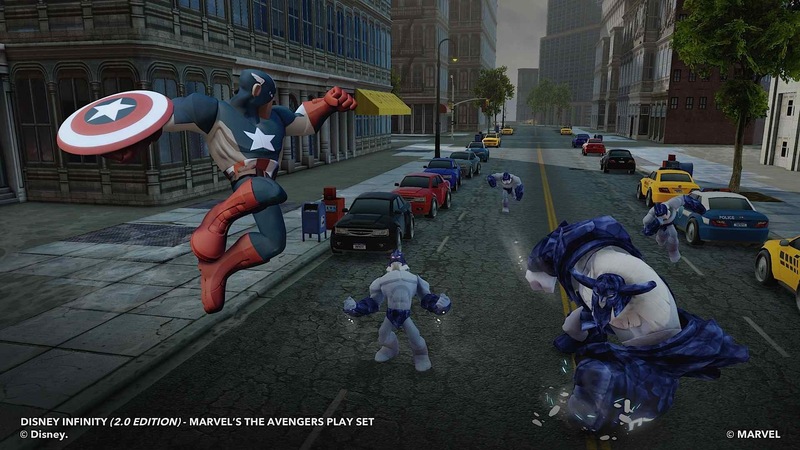 The city is lifeless with no real trademark Marvel landmarks save Avengers towers, contrast this with last year’s Lego Marvel Super Heroes that had so much Marvel trivia packed into its world it wasn’t funny. In a few occasions you’ll play a level in an interior environment but it’s either a bland warehouse of laboratory. Despite playing this game on now current generation hardware, in my case the PS4, the game didn’t really take advantage of the extra hardware boost. As I flew by the city you could see parts of it building around you as pass through like an old N64 game. Often I would get excited at the sight of what I though was a collectible, only to have my hopes crushed when it was the top of a water tower coming together. Cut-scenes, the few times there was one, also tended to look pretty ugly with a layer of grain like the video was poorly compressed. Outside of the main story missions that feel like side-missions in any other game, you can compete in a few mini-games that become available like motorcycle races or character specific brawls where the goal is to rack up a high score, but good luck actually finding any of them when you want to. There’s no map to speak with the exception of your radar that only points you to the main quest givers so you’re not able to set a waypoint for that one race your aching to get that gold medal or, or that Iron Man challenge the narrator just announced became available. Hitting the touch pad on the PS4 allows you to see your available missions and select a primary one, but excludes all available mini-games. The world and mission variety may be lifeless, but the same cannot be said of the figures, which are easily the best part of the package. All the figures look incredible and are well worth the extra money even if you couldn’t be bothered to play the game at all if you’re into that sort of thing. Watching them come to life on-screen when you place it on the portal that comes with the starter pack brings nothing but pure joy and it’s this aspect that had me counting down the days until this game came out. Playing with the characters in-game, whether in the play set or Toy Box, gives valuable experience which converts into skill points that you can allocate across a quite robust skill tree. You can unlock extra health, added attack power, an extra super move among countless other attributes. It’s thrilling to level up to see what you can add to your figures skill set and easily one of the best reasons to slog through the play set. The sobering reality though is that if you play with multiple figures, whether the three that come with the starter pack or extra’s that you purchase independently, there isn’t enough game to go around to see a lot of these upgrades. There’s a plethora of figures to purchase for the Avengers set (I’m not focusing on the Spider-Man and Guardians of the Galaxy set for now,) but not all are created equal. Getting around the rather large map will take a while if you’re going on foot, so you’re going to want to focus on a character with flight like Thor or Iron Man, that leaves the extra character in the set, Black Widow, at the mercy to the game’s motorcycle vehicle which control so terribly that you’ll find yourself crashing into scenery and other cars, though they are kind enough to fly out of the way so that’s a plus. Later on things get evened up a little when you’re granted an experimental S.H.I.E.L.D bike that transforms into a flying machine, but that’s far too late into the short campaign and something that should have been granted from the start. If after completing the Avengers play set you’re still hungry for a little more game and are indifferent to the Toy Box, the pack also comes with two mini-game discs: Escape from the Klyn and Assault on Asgard. The first is a tedious dungeon-crawler where you’re tasked with escaping from the prison featured in Guardians of the Galaxy film with the aid of a side-kick that you can level up with loot scattered about in the various maps. This game has the same problem as the main game, being your still just fighting the same few enemies ad nauseam. The second is quite a bit of fun and quite frankly a breath of fresh air to the entire package. Assault on Asgard is a tower defense style game where you have to protect various treasures belonging to Odin. You have a certain amount of currency you can spend on things like turrets, mines, barriers and other emplacements you set around a map to stop the horde of enemies from depleting the health meter of the item you’re charged with the safety of. What’s astonishing about both is that each was made using the tools that any average joe can use in the Toy Box, so if you’re into that aspect of the game, the sky truly is the limit. One of the playable introductions in Disney Infinity 2.0 puts you in the role of Aladdin, running through the streets of Agrabah, opening a door and then setting sail as Tinkerbell in Neverland followed by a horseback ride through Brave’s version of Scotland and it’s here that you see the magic of Disney and why this model works so well with those properties. It’s also here that you start to realize that perhaps Marvel isn’t the best fit for the Infinity series, as the characters are a blast to play around with, but the world, at least New York, isn’t that magical a place. If you’re the type who fell in love with the Toy Box in part one and wish to just transfer your characters into this year’s game, as well as slog through the play set to get the bits to plug into your own mad creation, by all means dive in. If you’re looking for a fun Marvel game to play with your toys in and don’t really care too much for the Toy Box, there’s a much cheaper option available. That all being said, I can’t wait for the few new remaining figures to come out, for even if I didn’t fall in love with Disney Infinity 2.0 as a game as much as I wished, I’m enamoured with the figures, whether or not they come to life on-screen or not. Nice response in return of this issue with firm arguments and explaining all concerning that.